From the first sip Pivovar Chotěboř made a great impression on me. Their Světlý Ležák is a perfect example of the style that made Czech beer famous around the world: solid malt base with a most subtle touch of caramel and the distinctive presence of Saaz hops, and the unfiltered version ranks among the best new stuff that has come out this year. During the SPP Awards Party I had a brief chat with Mr. Záruba, head brewer at Chotěboř. He told me that his brewery, which opened earlier this year, it's not a brewpub, but a "micro-industrial" (as I like to call them) that combines the latest brewing technology with Czech lager tradition (triple decoction, open fermenters and enough lagering time). Currently their capacity is 10,000 hl/year, which can be expanded to 25,000 hl in the current facilities. I took home two bottles from the party (světlý výčepní y tmavý ležák) and a branded glass to drink them from. One evening, while I was getting in the mood to prepare dinner, I opened Originál, thus is the name of their světlý výčepní. Nice golden colour, nice white head, nice absence of bubbles. Thin bodied, but not watery, enough malt to give it substance and the right touch of Saaz to help it do a good job at thirst quenching. With 4.1%ABV, it's an ideal session beer, made to drink půl litr after půl litr without fearing the consequences much. No more, no less. It's a pity that there aren't more micros in the world that brew something like this. Quite excited, a couple of hours later I couldn't resist the temptation of opening Černý Premium, only to end up somewhat disappointed. It pours a dark enough amber to be considered tmavé/černé, the right head. The nose is full of cola, with barely a hint of fruit and caramel. The taste follows the same lines, the cola ends up boring and made me yearn for the roast, coffee, cocoa or chocolate present in my favourite Czech dark beers. Basically, it is an uninspired beer that left me with the impression of something done with the heart put elsewhere. A pity. Anyway, the balance is more than positive and I'm already looking forward to tasting their Karamelový Speciál, which should be available already. I'm really glad about the opening of micro-industrial breweries like this and Pivovar Tambor, which also made its debut this year. Those romantics who leave their day jobs to set up a micro brewery and try to make a living out of what they really love often receive a lot of praise and admiration, and fairly so. But the same should be given to people like those from Chotěboř. Yeah, they are in for the business, they set up a shop to make money out of it, but still, the investment and risk must have been huge, more so in a market as saturated as the Czech. Shock! Horror! Czech brewer makes classic golden lager, and a dark one as well. Forgive my cynicism but surely the last thing the Czech Republic needs is yet another pale lager specialist? In reality the Czech Republic needs a wider distribution for the likes of Kocour, Primator and Zamberk, who are doing genuinely different things rather than simply re-inventing the Bohemian zythophilic wheel! Yes the Czech market is conservative, but that is why someone like Kocour is striking a chord with the more adventurous beer drinkers in the Czech Republic? Fighting for market share in an already crowded market is not a recipe for commercial success. Is really "brave" doing what a couple of hundred other brewers within your own borders are doing? 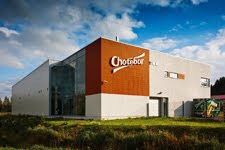 It is if you build a facility like Chotěboř's from scratch, one with a capacity of 10.000 hl from day one. One thing is being brave, another is being stupid, building a brewery like this to brew "ales" in CZ would be quite stupid. I'm not saying Kocour, Žamberk and a couple others don't deserve kudos for what they are doing, they do, and a lot, but they are micros, and so, a lot more flexible. Primátor, well, also deserves a lot of credit (and it does get plenty here), but once again, they are a well established brewery. At worst, their investment consisted only on adding a couple of small fermenting tanks for their Stout, EPA and Weizen. Another point - how many times have you stopped in for some bottles at a store and come away with say Kozel as the most 'independent' thing they had? The more brands like this break in with good beers, the more chance there is there may one day be more to the store shelves than gambrinostaropramen divide.. At least, it's a dream I have, not having to go halfway across down with a sturdy backpack just to get some bottles of what I'd like to drink. Well, that's the main thing, that they make good beer. It's what I care the most, really.